Natural aging, wear and tear and joint inflammation can limit mobility. 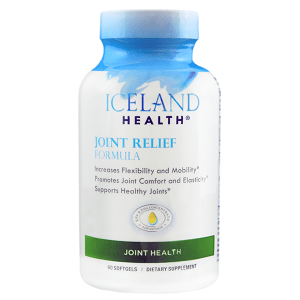 Joint Relief Formula is one of Iceland Health’s best selling softgels because of the mobility this product can bring back to customers. Joint Relief Formula’s synergistic blend combines molecularly distilled Omega-3 fish oil plus a doctor formulated blend of joint connective tissue targeting nutrients: Glucosamine Sulfate, Collagen Type I & II, Chondroitin Sulfate, and Hyaluronic Acid. This comprehensive formula targets and replenishes joint health. Hyaluronic Acide (as Sodium Hyaluronate) – amount in milligrams not provided. Dosage is 2 capsules daily. Each product container contains 30 capsules (15 day supply). 6 bottles – $25.95 each. The product vendor offers a 100% refund for up to 90 days from the date of receipt by the customer minus shipping and handling costs for unopened products The product vendor does a good job of spelling out their product return policy in the product source and includes a customer service number. Customer reviews posted in the product source were good (20 customer reviews were posted). However, the product is still expensive at $29.95 for a 15 day supply. Anyone considering purchasing this product should read the customer reviews carefully before buying. Mark Stevens	reviewed Iceland Health	on January 27th	 and gave it a rating of 2.